What are the characteristics of a wise person? What are the characteristics of a happy person? Can wisdom and happiness be measured? Can we increase our happiness by increasing our wisdom? 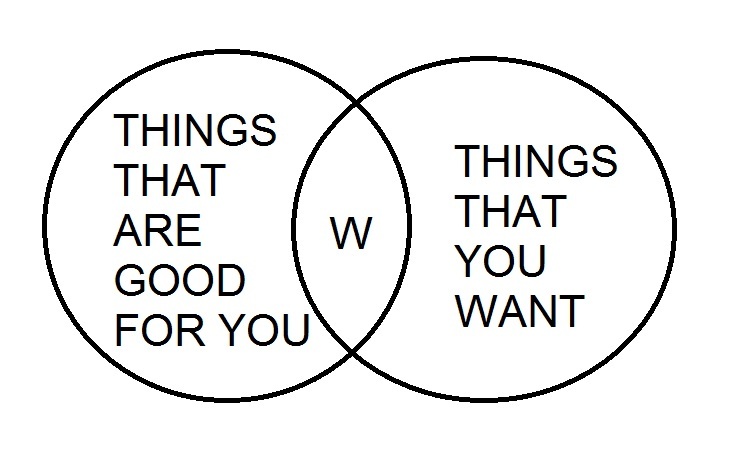 In the Venn diagram below I try to capture one possible aspect of wisdom: The relationship between the “things we want” and the “things that are good for us”. The set W is the intersection of these two kinds of things. I believe that the number of items in W may be a measure of wisdom, meaning that a wise person is able to understand what is good for him/her. Consequently, happiness would be the capacity to obtain these “things that we want and that are good for us”. 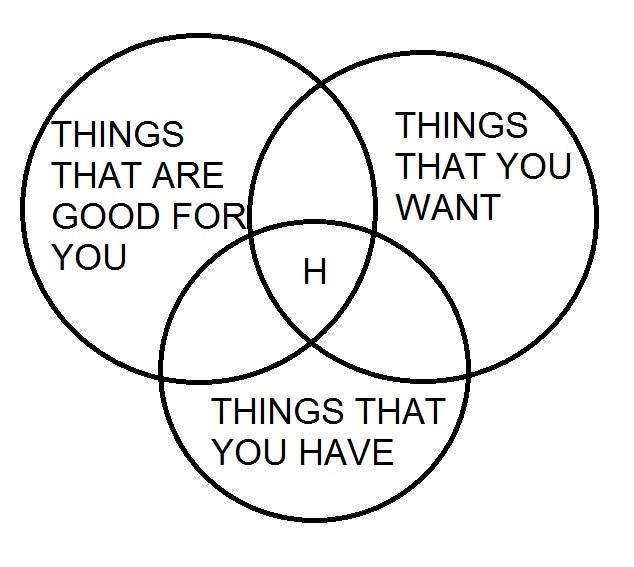 In the Venn diagram below, the set H is the intersection between W and the “things we have”. I believe that the number of items in H may be a measure of happiness, meaning that a happy person has many of these things that he/she wants and that are good for him/her. Of course I’m not talking only about material possessions. I believe that the “things you have” should consist mostly of the personal goals you achieved and the dreams you realized. So what is the the path to happiness? First you increase the number of things in W, by understanding which things are good for you and “wanting them”. Then you increase the number of things in H, by obtaining the things that you want and that are good for you. In other words, before realizing your dreams, make sure you are dreaming the right dreams. What do you think? Do you agree? Please share your comments below. The less material things I have, the better I feel. Friends and relatives expect me to own a car and travel abroad on vacations; they are all shocked when I tell them I am not interested. A lot of people live their lives according to what is expected of them by acquaintances without considering what is best for them. Agree. Trying to simplify your life is also a good strategy for happiness.